What gifts do I buy this year? What is the "in" thing for tweens? Is there anything unique that has hit the market? How do I know what to get for my niece/nephew/cousin's son/best friend's daughter? So, unless you're ultra-organized and have kept track of every interest of every child in your life, it doesn't hurt to have a little extra help, right? This year, that is not only made easier, but also incorporates charitable giving thanks to Kmart. First, Kmart has unveiled their annual Fab 15 ultimate list of hot holiday toys, making it easier to narrow down shopping lists for children of all ages. Whether purchasing the toys in-store, buying online and getting free store pick-up, or having them shipped directly home, getting the most wanted toys is easy, affordable and convenient. 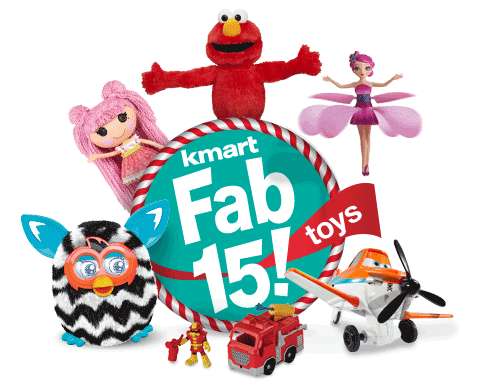 Just visit Kmart.com/Fab15 online or from a mobile device to find the nearest locations or place an order. Teenage Mutant Ninja Turtles Shellraiser by Playmates Toys, Inc.
Second, in addition to the Kmart Fab 15 list, this year Kmart has partnered with Share Our Strength's No Kid Hungry campaign to allow gift-givers the opportunity to donate Fab 15 toys to children in need. How perfect is that? Just visit the Shop Your Way Charity Gift Registry and 'gift it forward' to help make the season brighter for every child. I love that a parent can sit down at the computer with their child and not only quickly and easily browse toys that will surely top wish lists everywhere, but can also incorporate a wonderful lesson about donating to a good cause. 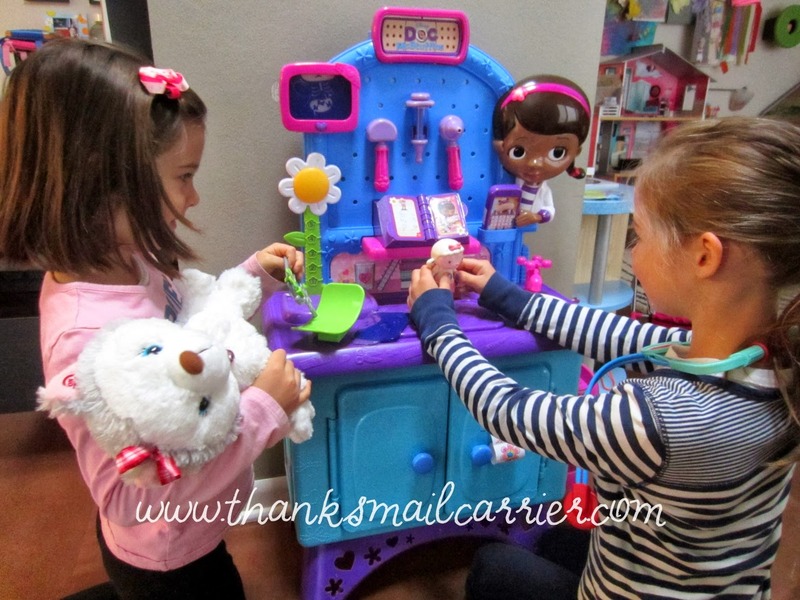 Around here, the girls and I have been discussing the importance of philanthropy and giving to others as well as having fun with the arrival of the Disney Doc McStuffins Get Better Checkup Center by Just Play. Including all of the accessories needed in order to heal toys of all kinds, the Doc McStuffins Checkup Center allows for measuring, weighing, x-rays, diagnosing boo-boos, and much more. Not to mention that it's just so darn cute and fun! 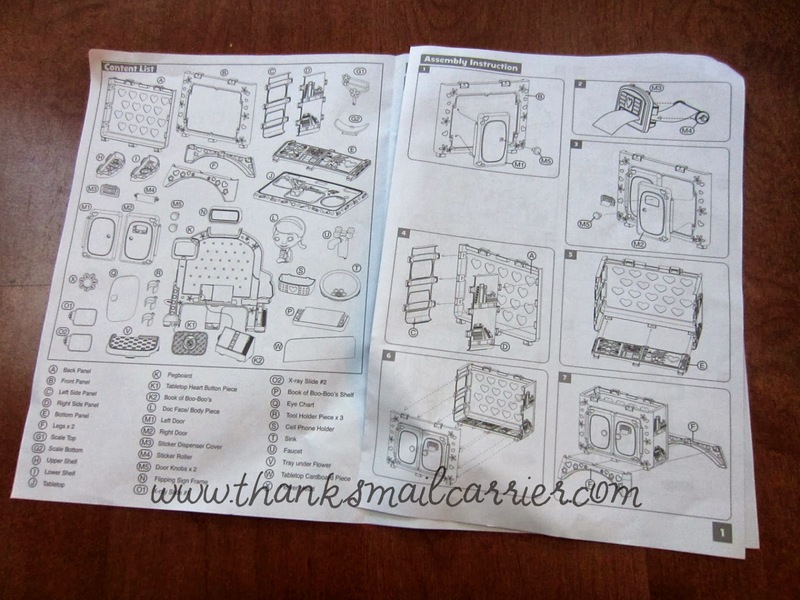 While I was initially slightly overwhelmed at the number of pieces, I found that Just Play included labeled, step-by-step instructions that made the whole assembly process not all that difficult. In around 10 or 15 minutes, I had snapped all of the various pieces together and stepped back to see Doc McStuffins herself peeking out from behind her colorful checkup/storage center. Standing in at just over 2' tall (20" x 6.5" x 27"), this colorful, pint-sized doctor's office includes a variety of tools, lights and sounds that make medical pretend play entertaining and fun. Both Big Sister E and Little Sister B were instantly thrilled to check out all of the little details and get right to work on making their stuffed animals and toys feel better! There are so many fun aspects to this set that the girls have returned to it time and time again! The movable growth chart, weighing their plush pals on the scale, putting Lambie on the examination table to hear Doc speak, turning the pages in the Big Book of Boo Boos to hear even more diagnoses, making "calls" on the play phone, pulling Band-Aids from the storage door... the fun never ends! As this Checkup Center is made from lightweight plastic and weighs only 13 pounds, it is easy and convenient to move from one location to another. On the other hand, however, the whole thing is a little less sturdy than it would be if it were made from thicker materials. All in all, even though it might have wobbled a time or two, it has still held up perfectly well to continuous play from all ages. Retailing for $74.99, the Disney Doc McStuffins Get Better Checkup Center is an entertaining, unique imaginative toy for any young Doc McStuffins fans. Be sure to head over to find out more from Kmart and place your order in time to have this waiting under your tree this holiday season! Find the entire Kmart Fab 15 list at Kmart.com/Fab15 and shop for any or all of the items at local Kmart stores nationwide or online. You can also connect with Kmart on Facebook and Twitter, while checking out their great Shop Your Way Charity Gift Registry to help make a difference in the life of a child in need. 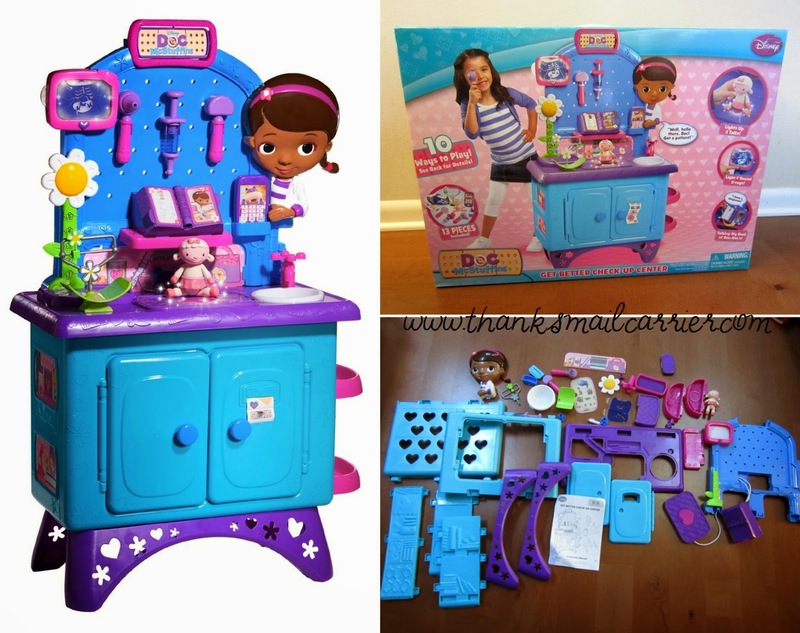 One lucky person will win a Disney Doc McStuffins Get Better Checkup Center from Kmart! A big thank you to Kmart for providing a Checkup Center for me to review as well as for one lucky giveaway winner. The opinions shared are my own and honest and if you really need to see more, click here to see how I roll. My granddaughter Olivia loves Doc McStuffin and this would be a great toy for her to play with. It is perfect for her age group. She loves playing doctor, putting bandaids on everyone! My daughter enjoys Doc McStuffins and this would allow her a work station to help fix her animals instead of me! Grand daughter Alexa has had to have a few doctor visits lately, so this would be so much fun for her to make-believe she's the doctor. My granddaughter is a big Doc Mc Stuffins fan and I know she would love this! My niece loves Doc McStuffins. She would love this because she is very creative and likes to play pretend all the time! My daughter would enjoy this because she loves pretending to be a doctor. My son loves Doc and would have so much fun with this. My kids would love it because they love pretend play. They especially love Doc McStuffins. I would love to win for my 3 year old goddaughter. She loves Doc McStuffins, but I think she'd love even more being able to play doctor with others.. she is currently going through chemo treatments and has been drawn to stethescopes! My grandsons would enjoy this center because they love to pretend play and this is one of their favorite shows to watch. My grandsons can perform check ups on each other! My little girl is just getting into play pretend and love to play with doctor's instruments. My little one just got into play pretend. She would love this! my daughter has just started getting into playing doctor - she'd probably try to use them on our pet cats! I have twin daughters who would love to play this together !! If I win these would not be for me, but I would donate to a childrens charity. I would love this for my daughter. Dramatic play is such an important part of children's development. How fun! My little guy loves Doc mcstuffin and his eyes got huge when I showed him this.. He loves to play doctor so I know he would have a great time playing with this set. Both of my kids would love this! They love to watch Doc Mcstuffin's and pretend to be doctors :) I would probably give it to my nieces for Christmas! My daughter would love this because she loves Doc McStuffins and watches her show all the time! My daughter loves Doc Mcstuffins! Its her 5th birthday theme! Such an awesome toy! My niece love playing with dolls. This would keep her busy for hours! My daughter already plays nurse with her dolls so I'm pretty sure she'd like it. She loves Doc McStuffins. She loves to take care of her baby sister and her stuffed animals. My daughter loves to pretend she is a doctor. She would love this. My niece would love playing with this check up center because she has a great imagination and loves to play pretend. My daughter is a huge Doc fan. She loves to give us all checkups, and she'd be thrilled to have a whole station with which to do it! My niece would love this because she's a fan of Doc McStuffins and would be able to do "checkups" on her stuffed animals. Thanks. I can see my niece playing with this everyday. She loves to watch Doc McStuffin! my two nieces would love this because they love pretending to be doctors and nurses and always want to make me feel better when i am sick. My daughter and son love Doc McStuffin. She always has him bring his stuffed animals to her to bandage them up. They would love this. She loves playing doctor and would have so much fun with this. They love playing Dr and they really love Doc McStuffins. I have 3 kids who would enjoy this. My daughter loves Doc and loves to doctor her toys, as well as everyone else in the house! I know she would love this! My doctor loves Doc McStuffins!!! She would be one happy girl if I won this for her and would play with it nonstop. My cousins would love this! My niece would love it because she loves playing make believe. My daughter would LOVE this med center, she is a HUGE Doc fan! my daughter already role plays like doc and this would help to further her imagination ! This would make my granddaughters whole year! They love Doc McStuffins and Sofia the First. my kids love Doc, they are always giving their toys check ups! my daughter loves animals and playing pretend. She would enjoy this toy so much. my daughter would love this!! she likes to watch the show all the time!! My granddaughter watches Doc McStuffins on Disney Jr., she would be so thrilled to be active in play with anything to do with her! I would love to win because I have 3 little girls that would LOVE this! They watch Doc everyday! My daughter loves not only playing doctor, but she also love Doc McStuffins! My granddaughter watches the doc on TV. Im sure she would like to pretend. My kids would like this because they both like to play doctor. They like to help mommy take care of the other sibling when the other one is sick. My daughter would enjoy playing with the checkup center because Doc Mcstuffins is her favorite show and she loves playing doctor on her dolls and stuffed animals. My daughter lves the show. Because my kids love playing doctor! 1. the colors! It's not like any playset on the market. 3. It's not your typical kitchen and will afford for hours more exploration and pretending!!! I have 2 preschoolers who love this character! My great grands are 2 & 3 and their mom works as a nurse in a childrens clinic. My little girl loves Doc and playing doctor to her stuffed animals! My daughter would love playing with this center because she is a huge doc mcstuffins fan and loves to give her stuffies a checkup. My girls Love Doc McStuffins and they would love to play like they were giving their stuffed animals a check up. My four year old has one she calls Kitty that she never lets go of. My daughter is always giving us checkups! I would actually give this to my friends daughter, I think she'd like it. This is our favorite show EVER! My sweet, soon-to-be three year old would love this for Christmas! Since our insurance coverage is about to skyrocket, this would definitely be a blessing - helping with Christmas gifts. Thanks so much for the chance to win! I would give this to my son's day care so all the kids could enjoy it. They love playing "doctor"
The girls love to play pretend house so this would be perfect for them. If I win I'll be donating it to our local Ronald McDonald House...you know sick kids and their siblings KNOW what it's like in a doctor's office and would like to play about it. My niece loves playing doctor and this would be perfect to give to her as a Christmas gift! My daughter would LOVE playing with this toy! She watches Doc McStuffins and loves to pretend she is giving her toys check ups! My daughter would Absolutely Love this!!! Would the best Christmas gift ever!! My kids love to play pretend and would love to have this for Christmas. Would the best Christmas gift ever!! My grandaughter would Absolutely Love this!!! My girls would go nuts over this. In fact, they are already asking for it for Christmas. They both love Doc! I was at a loss for ideas for my 3 year old daughter but I really think she'd enjoy this! Everytime one of my kids gets a boo boo I HAVE to kiss it then they sing "thank you doc for taking all the ouchies away.t didn't fe good ti fixed me I knew that you would. I feel better...so much better now" they LOVE this show! My niece insists that we play doctor every single time I see her and the niece gets what the niece wants ;) With a birthday right around the corner, this would be perfect for her! I have a 4 year old granddaughter that loves doc mcstuffins!! Doc helps us to be brave and really reminds us to wash hands, and stay hydrated! Both of my children LOVE to "check up" their dolls and toys. And Doc is definitely a favorite in our house! My daughter likes playing pretend with her stuffed animals so she would love this set. My little sister loves doc she had become doc now. its so funny, she has every toy made so far.all she needs is the center to complete the set. My kids don't have anything like this so they would enjoy playing with it. My kids both love Doc McStuffins. My littlest sings, "Tank oo doc for takin' ah muh ouchies awaaaay!" 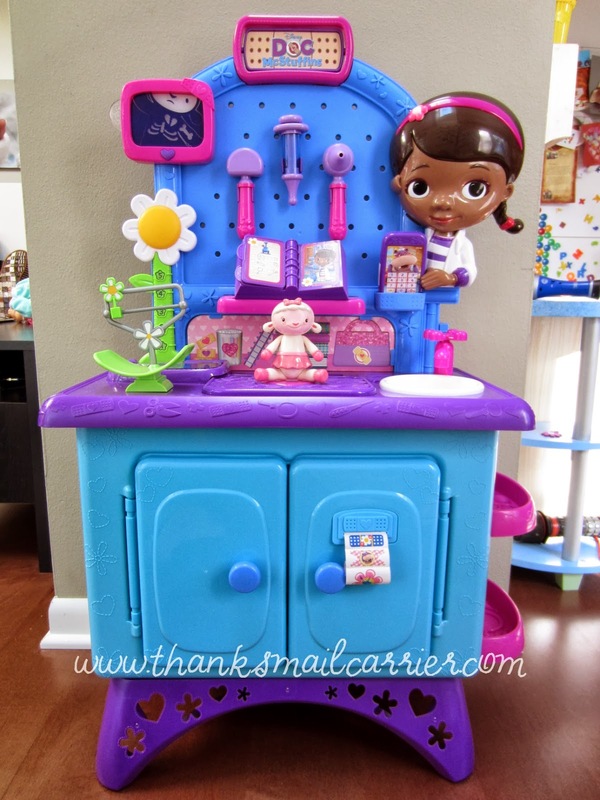 My daughter loves the Doc McStuffins Cartoon so I think she would love this! My granddaughter would enjoy this because she loves pretend play. My 4 yr old would love this!!! she is really into Doc Mc Stuffins right now, even wants to dress up like her for Halloween. :) Thanks for the great review. Would love to win this for my grand daughter Kailey. She has such a great imagination. Would love to watch her play with it and use her dolls and stuffed animals as patients. It is crazy to think that my son might actually like this! I wish it came in boy colors. My daughter would love to play with this because she loves watching the show and playing pretend doctor with her own stuffed animals. My daughters, Ainslee and Avery LOOOOOOVE Doc McStuffins and love to give their animals checkups. This center would be perfect for them! My son loves to pretend to be a doctor and he likes watching McStuffins! My daughters love Doc McStuffins and love to help people. They play pretend and make believe all the time. Perfect gift for my sweet granddaughter. My kids love to pretend play that they are doctors! They would love this! The little girl I nanny - her mom is a doctor! She would LOVE this! My 3 middle kids would love this. My little niece is a HUGE McStuffins fan! She would enjoy this. My niece would love this because she loves watching the show and she loves to play with her dolls. My daughter is a huge fan of Doc Mcstuffins. My 2 and 4 year old are both big fans of Doc Mcstuffins, they love playing doctor. This would make the perfect Christmas gift! My niece would love this because she is always trying to fix her doll's 'boo boos' and check her temperature. My little girl would love this to stand and play at, and as she gets older to play doctor! I think this would be great for pretend play but also for getting children prepared for doctor visits and checkups. my niece would love this she got a doctor bag with the doctors stuff in it and she drives everyone crazy checking them out. we are glad when she is checking her dolls because we get a break. My 3 year old daughter would love this for Christmas or her Birthday (also in Dec). Doc is her favorite character and she even wants to be a doctor when she grows up just like Doc. She was even Doc McStuffins for Halloween last year, I had to create her own since there was no Doc costumes last year. She can't wait to play with this Center, so I hope she wins!! I think my daughter would love this since she likes to take care of her baby. My new phew and nieces like this show. They would probably play with this. My daughter loves the tv show and has several of the stuffed dolls and toys. She'd love this. My son is a big Doc McStuffins fan and I know he would love this! Thanks so much for the fantastic giveaway! My daughter wants to be a doctor when she grows up and always gives me physicals. My niece would love this for Christmas! eeck so many reasons my daughter LOVES doc mcstuffins and she loves to play dr.. so those two reasons alone are the reason I HAVE to have this! My kids enjoy this show and they like to play doctor with their stuffed animals. They would really enjoy this. 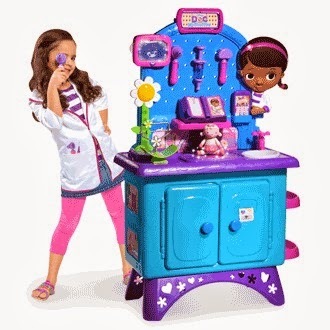 My kids would love to play with this check-up center because they love Doc McStuffins and would love to emulate her by pretending to fix all their toys and dolls. Our girls would love this, they love Doc McStuffins. 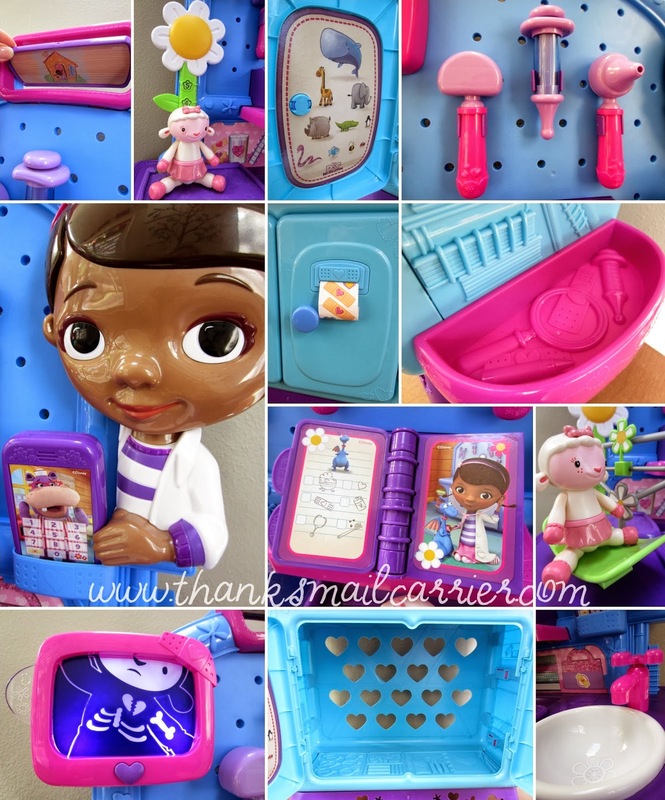 My daughters love Doc McStuffins and would love to do check ups on family and their toys! Both of my kids would love this! My daughter has a note book she calls her Big Book of BooBoos. Everytime someone is sick or hurt she pulls it out and makes up a diagnosis. They love to play pretend and their Mom works at a hospital. I have a 10 year-old daughter, and I babysit for a 2 1/2 year-old little girl. They love to give their stuffed animals check-ups! This is all my granddaughter has been talking about since we were in town walking through the toy aisle, There was a small Doc McStuffins Checkup kit there and she pressed a button on it and it talked. It said I need a hug and she fell in love with it. My 4 year old daughter LOVES doc mcstuffins! My niece would love to play with this set! My kid is big into pretend play right now (doctor, chef, etc) and looooves Doc McStuffins! My kids would enjoy playing with this because they're always curious about what doctors do and doctor is one of the make-believe games they like to play (teacher is also very popular right now). My 3 year old loves Doc McStuffins! We love to lay in bed and watch the show together, she now runs around the house listening to everyone's heart to make sure it is "good"! My daughter would enjoy playing with this because she loves to play make believe. She has an active imagination. my niece wants to be a doctor and would love this so much!! This would be great for pretend play. My two oldest love playing doctor and vet. My granddaughter has a little cheaply doctor kit that she just loves pretending with I can't even imagine how excited she would be with this! My niece loves playing pretend anything - she would love this! My 5 year old daughter loves to play doctor. She tells me everyday that's what she wants to be when she grows up. She also loves this show. I have two chronically ill children. My 3rd, and healthy child, is 3 yrs old and is playing doctor helps her understand what is going on with her two older siblings. She would love this! Play cooking is one of my kids favorite things to do. My niece would love the colors and she loves imaginative play, so I think she would really enjoy this toy! Kids? I would like playing with it! Just kidding! My great niece would just love to have this...so much fun! My neice would love this to play doctor with this. My children are scared to death of the doctor, but love to pretend that they are doctors. They would love they. Because it has a lot for them to do...just not one single thing. My grandchildren are 5 and 3 and love to play make believe, they would love this. My sons LOVE, LOVE Doc MscStuffins and are huge fans! They both have the book of boo boos and the doc check up kit from earlier this yeat, I can't even imagine how they would act if they got this!! My twins love this show. They love new toys and would really enjoy playing together! Thank you! My daughter loves to watch Doc McStuffins. She walks around wearing a stethoscope and even has a stuffy stuffed animal she gives checkups. Oh and she write her diagnosis down. Usually her baby sisters diagnosis is cry-osis. She would love this. Thanks for the chance! My kids love the show, and my daughter loves pretending to be a doctor and checking her animals (and twin brother)! My cousin has spent a lot of time in the hospital and this would be a cute toy for her to play with. My daughter in law is pregnant and going to have her baby any day. Ava (my grandaughter) has got to see lots of doctor stuff through out the pregnancy and I think she would enjoy "being the doctor"
we love watching Doc McStuffins. This makes me think of a play kitchen yet it is so much cooler would be so much fun! My son dressed up as a doctor this Halloween, so it would perfect! My daughter would love this because she loves Doc McStuffins and loves healing her dolls. Thanks for the awesome giveaway! My niece would love this because she wants to be a doctor when she grows up now.